Title live blogging the Town-Hall style debate published to cocoa-touch. At least six million questions have been submitted via the Internet to be asked at the town-hall-style presidential debate Tuesday in Nashville between Senators Barack Obama and John McCain. That’s a lot of queries for 90 minutes, and obviously they won’t all get asked - there will be time for only 15 to 20. The moderator, Tom Brokaw of NBC News, is sifting through those millions of questions to find six or seven that he might pose. The other dozen or so questions will come from among an audience of about 80 likely voters from the Nashville area who will be on stage with the candidates. Mr. Brokaw will meet with audience members on Tuesday as he seeks a balance between foreign and domestic topics. The live audience was selected over the last week by the Gallup Organization, which made thousands of calls to find people who are truly uncommitted - that is, they may be leaning toward one candidate or the other but could still change their minds. “Only a small percentage of the population qualifies as uncommitted,” said Frank Newport, editor in chief of the Gallup Poll. 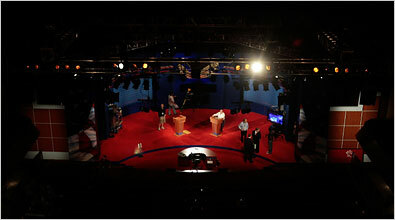 The format allows about five minutes for each question: two minutes for each candidate and one minute for what the co-chairman of the Commission on Presidential Debates, Frank J. Fahrenkopf Jr., described as “interplay” to be managed by Mr. Brokaw.